A card for fall has such beautiful colors, so rich and warm. 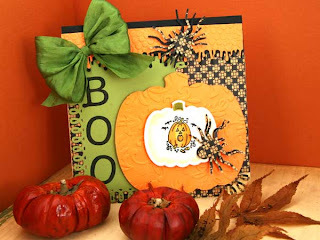 Sharon's challenge for this week was to make a card or project for Halloween, or perhaps a bag or container for treats! Anything goes. Click on the picture to enlarge the card to get a close up look at the details. Renaissance Faire Collection Paper Pad. I just love this paper, the prints are so vintage and small that it makes great paper for cards. The corners were punch out with my new Martha Stewart Corner Loop punch and it was then attached to the card stock. The Drippy Doo Punch by Martha Stewart was calling to me as it made a perfect topper for the card. I punch both black and orange so that it could be layered. 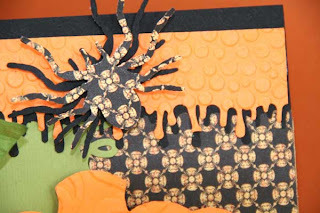 Before attaching the orange onto the black paper, I used the Cuttlebug Tiny Bubbles embossing folder for some texture. 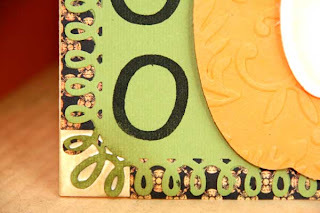 Next, I used a 3 3/4 x 5 inch piece of card stock and bordered it with the new Martha Stewart Corner and Edger Loop Punch. (I will be featuring these on Monday). JustRite has these neatest Large Alphabet stamps that I used to spell out the word Boo. I slightly angled them to make them look spooky. They were attached with Glue Glider adhesive tape gun. Spellbinders recently released their new Pumpkin Nestibilties (which I will be featuring Monday) and the largest die was perfect for my pumpkin. After running it through the Victoria Cuttlebug Embosssing folder, I used Therm-0-Web Dimensionals to attached it to the DP. Before I started any of this, I stamped the pumpkin from the JustRite Favorite Occasions stamps and cut it out using the next to the smallest Pumpkin Nestie. I colored it with my Copic markers. It was distressed with Ranger Distressing ink before removing it from the die and popped up on top of the orange guy. Pretty neat huh? Spiders are so spooky and I thought they looked great on this card. They were punched out using Martha Stewart's Spider Punch from the DP that I used for the background paper. Aren't they cool? I cut 4 out and gave them dimension with the smallest of Therm-o-Web Dimensionals. This card just called for a bow (don't they all). I added it to the top left to balance the heaviness of the right side. Below are close up shots that might be helpful. Notice the Graphic45 Designer Paper too. Totally adorable Joan, I love it! That spider is so cute! OMGosh, Joan! 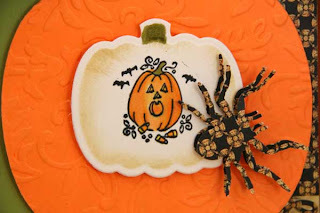 This is really cute but those spiders look like they could crawl right off the card! Neat idea to punch them out of your background paper, but honestly they give me the willies! LOL Love all the Martha punches you used for the borders and such, and the pumpkin Nestie looks awesome! FANTASTIC!!! LOVE all the details on this creation ... the corners, the PERFECT ribbon/bow ... and of course those AMAZING spiders! I'm very impressed with your photography too ... wonderful staging! Dang lady ... you are just getting TOOOOO Good!! I LOVE THIS in every sense of the word!! This is too cute. THOSE SPIDERS are the best ever!!! Great use of punches and papers here, Joan!! !